On Tuesday, I had the honour of speaking at the Internet and 21st Century Revolutions conference in Madrid on behalf of Ushahidi. The event, organized by AERCO (Spanish Association of Community Managers), discussed the role that internet and social media played in the North Africa and Middle East revolutions. 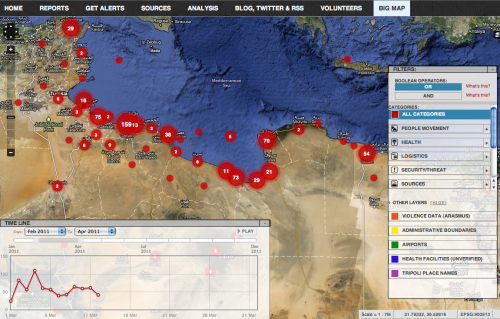 Ushahidi, the open source mapping platform which was used in the disaster response of Haiti earthquake, Australian floods and the Japan tsunami, also played an important role in the Egyptian protests and Libya crisis as a communication tool for the affected groups, as well as a means for those outside the region to bare witness. The Egyptian maps called U-shahid which means 'you witness' in Arabic, were deployed by Development and Institutionalization Support Center (DISC) in Cairo. The maps were used to monitor the events during the election and #Jan25 revolution as well as the constitutional amendments on March 19th. A few interesting points about the U-shahid maps. One, DISC was well aware that the site could be taken down by the government and their involvement put them in risk of arrest. Two, the site was fully translated into Arabic to allow the widest participation from the people of Egypt. Three, the map leveraged social media sites like Facebook and Twitter allowing for easy sharing of incident reports. Also interesting, wall posts to the Facebook group were directly converted into incident reports via the email notifications sent from Facebook. Four, the homepage automatically displayed Flickr photos and YouTube videos of the events based on their tags, making the site a valuable source for information, photos and videos of the activity on the ground. Five, email and SMS alerts helped keep people informed of incoming reports based on categories like Violence Against Protesters or for a specific location like Tahir Square. Six, when the internet was take down in Egypt, the maps also went offline since the servers were hosted in Cairo. 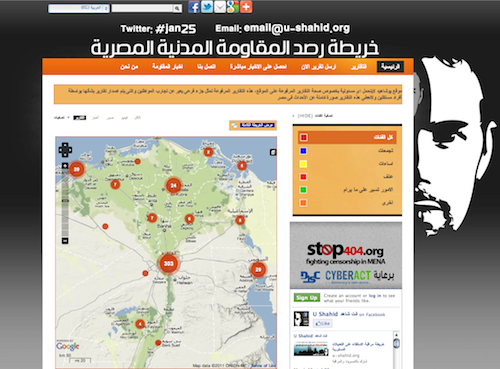 Another #jan25 map was created on the cloud based Crowdmap platform to receive reports while the U-Shahid maps were down, although the number of reports were greatly reduced due to the lack of internet access. 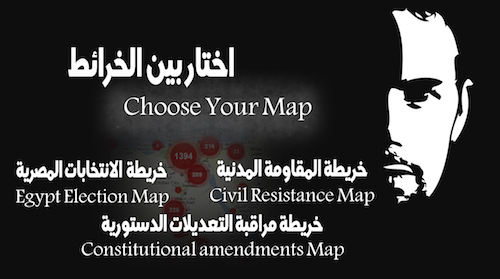 Finally, since DISC was already familiar with deploying the election map in November, they were able to quickly spin up another map during the revolution and constitutional amendments. 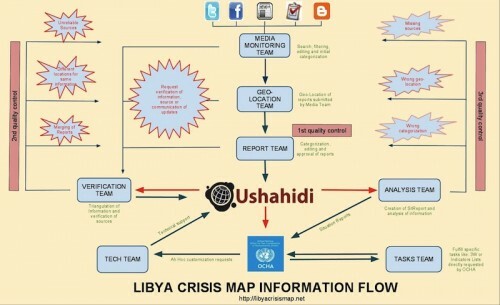 On March 2nd, the United Nations Office for Coordination of Humanitarian Affairs (OCHA) requested the Stand-By Task Force (SBTF) be activated to help map the Libya conflict. The initial map was password protected to ensure safety of reporters, but later made publicly accessible. It's important to note that the SBTF is not an official arm of Ushahidi, but a separate initiative to leverage the power of volunteer crisis mappers. The group now has 450+ dedicated volunteers in over 50 countries that can be activated on short notice to provide support for humanitarian groups during times of crisis. The Libya Crisis Map was very different than other mapping efforts. One, they didn't need to train volunteers like in Haiti, the Stand-By Task Force was simply mobilized. Two, a number of customizable features like the Big Map were simply enabled via the Ushahidi Plugin. Three, Haiti response was an actual Ushahidi team effort, but this was United Nations initiative that called upon the Stand-By Task Force. Four, the map is a testament to applying the lessons learned form Haiti and seeing the SBTF in action. It is also great example of a large organization like UN OCHA leveraging the power of Ushahidi along with an effective data flow process. It's important to note, that the maps were not used during the revolutions in Tunisa, because there was not a local group able to deploy the software and coordinate the effort. Ushahidi is an incredibly powerful platform, however the technology is only part of the effort and a successful deployment requires a lot outreach, monitoring and an effective process. As George Chamales, a coordinator with the SBTF says, "a map is only as useful as the process and people to make it happen." In the case of Egypt, DISC did a remarkable job taking advantage of localizing and customizing the platform as well as embracing the power of social networks. One of the members of DISC had interesting insight prior to the election regarding the role that social media was having for political conversation;"The use of social media and Facebook in particular is increasingly enabling the youth to engage in a political scene that normally opts for the physical elimination of the opposition. Blogs and Facebook groups are clearly taking the place made empty by the lack of a real political debate in Egypt, and are more increasingly emerging as an alternative political scene where a discussion on democracy and human rights is still possible." Anand Giridharadas, a journalist at the New York Times also had a great quote about the value of using technology to bare witness;"They say that history is written by the victors. But now, before the victors win, there is a fresh chance to scream out, with a text message that will not vanish. What we would know about what passed between Turks and Armenians, between Germans and Jews - and indeed would it have happened at all - if each of them had had a chance to declare and be heard saying: 'I was here, and this is what happened to me?'" Technology is a great enabler for communication, collaboration and coordination, allowing groups to mobilize and share information. It can also empower disadvantaged groups helping give citizens a voice, whether thats those affected by the Japan tsunami or protestors in Egypt. It shouldn't however overshadow the importance of real human networks. As Patrick Meier and Clay Shirky have both expressed, ensuring that citizens have a means to organize, is as important as ensuring citizens have access to information. As a global community, we need to be concerned with censorship on the internet, or the ability for governments to block its capabilities. The internet is incredibly powerful, but how useful is it when governments can simply shut it down? Mobile devices can quickly mobilize a group, but how useful does it become when cell networks can be taken down? We must all strive to ensure that others have a voice. As Wael Ghonim, the Google employee who helped organize the #Jan25 revolution said, "the power of the people, is much stronger than the people in power." The Spanish newspaper EL PAÍS, wrote a great article capturing some of the discussion from the conference. Had they been any riots in North Africa and the Middle East without the Internet? That question can be heard in any debate that puts the focus on events since December in the region. From time to listen, some will think that the most important is the Net, however, this process is also the result of years of labor organizations in defending human rights and freedom of expression. Internet is just a tool. A tool, yes, that is changing the paradigm of information, because people do not always need an intermediary, such as large media-to know what happens: you can now also turn to social networks and sites like Ushahidi or Witness. These are some of the ideas that motivate the debate online and social revolutions of the century, organized AERCO (Spanish Association of Community Managers) and is held this afternoon at La Casa Lit by Caja Madrid. The lectures will be followed on Twitter, the hashtag (item) #isocialrev. "People who work with social networks, we find troubling the role that becomes the tool itself, which comes to overshadow the role of the person behind," said Leila Nachawati, international representative of AERCO and one of the speakers. "You hear about concepts such as Facebook revolution, in my opinion, obscure the political analysis of conflict and what has led us to this point," he adds. Another saying 'but' to the praise of the network is the Iraqi blogger Raed Jarrar, who admits he has helped people from social networks to mobilize, but governments have used to repress, that is, a space that can reach the suppression of an oppressive regime. In his view, the Internet has been instrumental in the riots, as evidenced by the demonstrations in Iraq, whose Internet penetration is less than 2% of the population, and in Egypt, where the government cut Internet service, but the revolution continued and even more people hit the streets, proving that there are other tools that are making possible the protests. Recovering the voice of the bloggers "Maybe the Arab revolution would not have been possible without the Internet, but that does not mean that the Net is the most important thing," says the Tunisian Sami Ben Gharbia, director of Global Voices Advocacy. "In any case, every revolution, every change, you need a way to expand your message" she continues, and in this case has been the Internet. Ben Gharbia knows what he means, as the organization which works is an international network of bloggers who translate and defend the blogs and citizen media worldwide. Either way, the impetus to these social movements can not be attributed solely to Twitter and Facebook. Two of the experts participating in the sessions of the House Flaming represent alternatives to mainstream social networks such as Witness and Ushaidi. Matisse Bustos, head of communications at the first page says that Witness (Witness) is an international organization that defends human rights and seeks to document, through videos, if they are violated. Your challenge is to protect the identity of the activists to ensure their safety and try to get as many people as possible see the videos to prove whether this is real information. 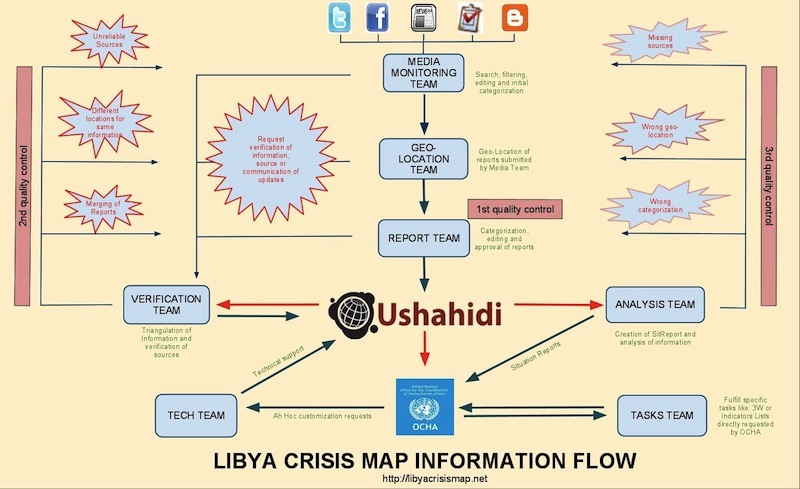 For its part, Ushahidi is a tool for creating interactive maps useful in situations of crisis or danger from the information submitted by citizens through various channels such as email, Twitter or mobile messages. Dale Zak, who has participated in developing this technology, says it is an open source project used to develop citizen journalism has played a role, for example, the recent earthquake in Japan and the subsequent nuclear crisis. With this momentum, the corporate media are also changing their perception of today and increasingly using citizen journalism and the sources providing the people themselves. An example is Al Jazeera, whose coverage of the riots, in which he participated Randeere Bilal, a speaker at the conference, has inspired other means for seeking evidence through social networks where journalists can not reach. But here too there are reservations. "Most of the mass media have great interest and often prefer to support governments rather than citizens," says US-Iraqi blogger Raed Jarrar. "Therefore, we must create alternatives to big media groups." Many thanks to AERCO for organizing the conference. This was an important conversation to have, and it was a real honour to speak alongside Raed Jarrar, Sami Ben Gharbia of Global Voices, Matisse Bustos Hawkes of Witness.org, Randeere Bilal of Al Jazeera and Leila Nachawati of AERCO.